A man has been taken to hospital after he was injured "exiting" a police vehicle. Dyfed-Powys Police said the passenger in the vehicle was hurt on Church Street, Llanelli, at 12:20 BST and the area is closed as officers investigate. The injuries suffered by the man are not thought to be life threatening. 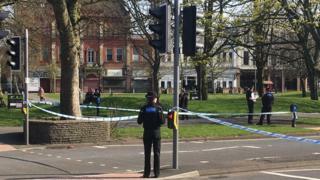 People have been warned to avoid the area while it remains closed and police officers appealed for witnesses to the incident.